These nine movies are on eight discs within five sets. All were free* from Amazon. Bad Boys is the only upgrade from a previous DVD edition. It’s also the only other movie (besides The Rock) in which is a good Michael Bay directed film. The rest of the movies are first time purchases, but not necessarily the first time I’ll watch them. I’m not as big of a fan of Batman Returns as the original from 1989, but I found it worth getting after watching The Film Den on it a few months ago. A similar thing happened with The Hunt For Red October. I had watched a Lost in Adaptation episode on it and I was interested enough to check it out. I liked it enough after seeing the movie itself that I added it to my list. The rest of the movies are on multi-movie DVD sets since they aren’t available on Blu-ray. The American Ninja Double Feature set are the two sequels after the original I already found in a three film set. The final four movies are lesser known works of Michael J. Fox spanning from 1987-1994. I’ve previously seen The Secret of My Success, The Hard Way, and For Love or Money. I haven’t watched Greedy yet, but I have been trying to get it to win a voting round on Twitter which hasn’t happened yet. Those three movies I did watch were pretty decent from what I can remember. It’s also not a bad price for this DVD set titled Michael J. Fox Comedy Favorites Collection. That’s it for me. Have a good one! *Free as in gift card money. Hi, there folks. I’ve new purchases to speak of and movies I’ve since watched in the last week. The Hunt for Red October is a thriller of a film with Sean Connery as a defecting Russian sub captain. It’s probably the only time I really liked a Tom Clancy book come to the silver screen. The next, as voted on by my followers via Twitter, was The Deer Hunter. Sadly, I didn’t get more than an hour into this one. It just didn’t hold my attention and, at the length of three hours, I felt it was too long so I moved onto the next vote. This one was Ghost from 1990. Regardless of the main stars on the poster, Whoopi Goldberg’s character interacting with the ghost of Patrick Swayze’s character is played seriously, but ends up fairly goofy. It was hilarious to watch. The next two films to vote on are Zoolander (2001) and Sicario (2015). You can vote in the comments section below, if you wish. A controller I had seen from Capcom was advertised back in the ’90s with the Super Nintendo and Genesis port of Super Street Fighter II. It’s called the Capcom Pad Soldier. Its design is quite odd. After remembering it all these years later, I wanted to try it out so I purchased a used one from eStarland. The buttons are at an odd angle for use of your thumb, though it’s doable. It’s at that angle to suggest the use of your fingers instead. It’s quite the unique experience that I can see using on a SNES, but Sega’s 6-button controller on the Genesis is more than adequate. This is true and exactly what I did. As soon as he told me about the sale on Yakuza 5 I was like “Oooohhhhhh!,” turned around, and took advantage on said PSN offer. Also, speaking of offers I took advantage of, I had major discounts available to me at the nearby Meijer. I took them up on a $30 off Assassin’s Creed Syndicate digital coupon, 20% off GM employee coupon, and the regular 10% employee discount. This got me three PlayStation 4 titles: Batman: Arkham Knight, Bloodborne, and the previously mentioned AC game. I’m sure it won’t be difficult to find co-op buddies for Bloodborne in the future once I’m ready to Game On once again. Remastering of last generation games — are they worth it? Free-to-play or Free-to-start — which is it? Also, we chat about Gamestop’s horrible recycling program, Nintendo going mobile, and Usagi704 purchases a Bloodborne PS4 faceplate…live! All this plus your feedback and more on episode 61 of the Hart & Usagi Podcast. 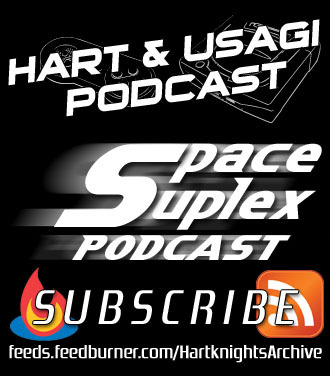 Enjoy the show and remember to subscribe via RSS or iTunes and follow the Hart & Usagi Podcast on Twitter!